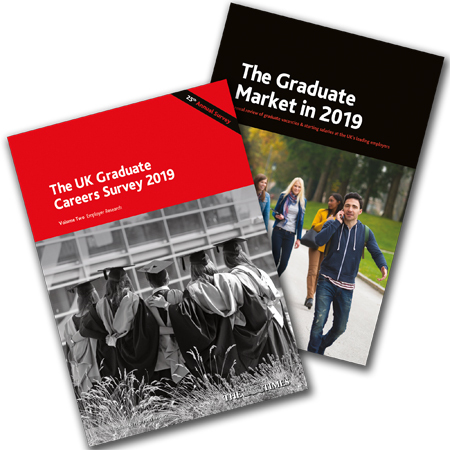 Each survey gives employers an exclusive insight into the career expectations and aspirations of final year students – just weeks before they leave university – and provides a definitive record of how they have conducted their search for a graduate job. Since its launch in 1995, the survey results have been used by more than 150 of the UK’s best-known employers to review, assess and develop their campus recruitment campaigns. Highlights from the research are regularly reported in the national press, including Financial Times, Daily Telegraph, The Guardian, The Independent, Daily Mail, Evening Standard and Times Higher Education. This extensive research is used to compile The Times Graduate Recruitment Awards which High Fliers Research hosts and presents annually, celebrating the UK’s most successful and accomplished graduate recruiters. The winners of the 2019 awards were announced to an audience of more than 400 graduate recruiters at Kings Place in London in March, our twenty-second annual awards ceremony. The Times Top 100 Graduate Employers, the annual careers directory and website that showcases Britain's most sought-after graduate employers – is also produced from the results of our student research programme. The 2018-2019 edition was launched in October 2018 and more than 75,000 copies of the directory have been distributed to graduate job hunters at universities around the UK. In addition to its student research, High Fliers Research hosts the annual one-day conference for graduate employers, The National Graduate Recruitment Conference, and regularly analyses the latest graduate vacancies and starting salaries available from the UK's top employers. The High Fliers Research Centre is in The Gridiron Building, 1 Pancras Square, London, N1C 4AG. Our telephone number is 020 7428 9000 and a location map is available here. To find out how your organisation could access our student research programme, please contact Sally Hyman for The UK Graduate Careers Survey or Zoe Gordon for The Law Student Survey.